Icebug Spirit 7 OLX has just been released by Icebug. Our experts are working on a detailed review. Please, come back later. Light and fast. Unfortunately, also forgettable. The Icebug Spirit 7 OLX is a rugged shoe best suited for rugged terrain. This shoe is light, this shoe can be fast, this can be a shoe for those looking to conquer challenging terrain. The Icebug Spirit7 OLX is ultimately a mediocre shoe. The Icebug Spirit7 OLX has a well designed and rugged outsole. The rubber provides plenty of grip and the studs only improve the grip on many types of terrain. These shoes gripped well on every type of trail I used them on with one exception. Rocks, mud, dirt, roots, dry, wet nearly every terrain type this shoe chewed up and spit out. Because of the studded outsole, I am sure this shoe would also do well on snow and ice. However, I did not have an opportunity as all the miles on have put on them have come during the summer months. The only time I felt unsure of my footing with the Icebug Spirit7 OLX was on smooth rocky outcrops. Several of the trails on run have smooth granite outcrops every so often. On these sections, I had to really slow down as the studs were just sliding on the smooth rock. These shoes also have a well-designed lug patterning for shedding debris. Many trail shoes struggle to shed mud and other trail debris. The Icebug Spirit7 OLX is one of the best shoes I have ever run in, in terms of the ability to get rid of the mud, rocks, etc. 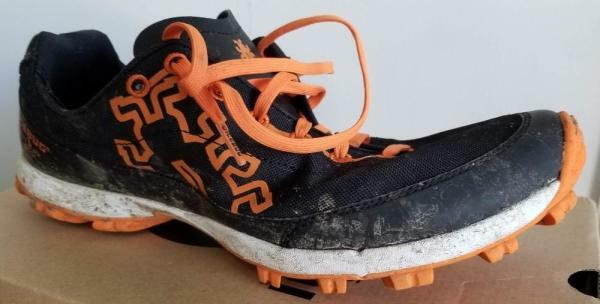 Running with caked on mud can hamper speed and energy, but no worries with this shoe. The Icebug Spirit7 OLX came in at 295 grams or 10.4 oz in a size 11.5. This is very lightweight for a trail shoe in size 11.5. The lightweight allows for easy turnover and a natural feel at faster paces. This can't be said for all trail shoes as some are so heavy and cumbersome, they feel more like hiking boots. This is not the case with the Icebug Spirit7 OLX. It is true to a minimal lightweight design. The Icebug Spirit7 OLX is designed to be minimal and lightweight. Icebug is spot on the minimalistic style with the Spirit7 OLX by making an incredibly flexible shoe. There is no rock plate so the underfoot protection is lacking, but the natural feel and flexibility are on display. I think the flexibility not only makes the shoe feel natural underfoot also allows the shoes to work with the terrain to provide great traction. I have had no durability issues with about 60 miles on these shoes, both the upper and outsole are like new. I find this to be great for a lightweight trail shoe. There are thick rubber lugs on the outsole and durable mesh on the upper. Extra stitching on the upper and toe cap provides added durability. For me, the Icebug Spirit7 OLX fit wrong all the way around. I am a true 11.5 with average foot volume, and the fit just didn't work for me. The Icebug Spirit7 OLX is true to length but that's about the only positive for the fit. The forefoot and midfoot are extremely narrow, even when compared to many road racing flats. If you enjoy shoes with a wide toe box, this shoes is far from it. The heel was on the other extreme. No matter how I laced the shoes the heel was always a problem. When laced tighter, and there was pressure on my Achilles, especially on the heels. When laced looser, the fit was sloppy my heel would slip. I found the fit frustrating. If you are a true fan of minimalist shoes, you may have no problem with the lack of underfoot protection. I am not one of those runners. I am usually somewhere in between. I enjoy a shoe with some flexibility and ground feel, but I don't want to feel every rock and root on the trail. For me, the lack of protection caused me to slow down on trails I would normally cruise. I was often stepping over roots and sharp looking rocks. When I really wanted to pick up speed on downhills, I was always having to slow down to find a safe foot placement. The lugs provide plenty of protection but the areas between the lugs and the midfoot with only one lug, just don't provide enough protection. When running on the trails I don't want to worry about every rock or root, I just want to go. I want to trust my shoes. I couldn't trust the Icebug Spirit7 OLX. In my opinion, a versatile shoe is a great shoe. A shoe that can be worn for workouts at different speeds and distances is great. Unfortunately, this shoe is not a "jack of all trades" it is a "one trick pony." The studded bottom is great for soft ground, but they are unwearable for any distance on road. There is a trailhead 1/4 mile down the road from my house and I wanted to take these off and walk barefoot. When running on pavement and even gravel you can feel the studs jabbing you up from underneath. It is a strange sensation, which is not enjoyable. These shoes really excel in soft ground, they grip, and they shed mud. I want a shoe that can do a little more. In addition, because of the fit discussed early. This shoe is really limited to shorter distance runs. Any ran longer than about 45 minutes in the Icebug Spirit7 OLX was uncomfortable. My favorite race distance is the 25k (about 15.5 miles) and I wouldn't pick these as a race day shoe. Maybe a short obstacle race or a mud run, but these shoes won't work for most typical trail races distances. At a retail price of $170. I want a shoe that can and will do anything I ask of it. Simply, that is not the case with the Icebug Spirit7 OLX. $170 is too expensive for a shoe with such a narrow range. The Icebug Spirit7 OLX has some really good qualities. It is lightweight, it is grippy, it feels natural underfoot. In the end, I was just disappointed. I really want my shoes to inspire confidence. I want to be able to run and not worry about what's on my feet. A good shoe should simply be an extension of your running stride. With the Icebug Spirit7 OLX, I never felt that way. Either my feet hurt because of the sloppy fit, or were battered and bruised from the lack of protection. Unfortunately, this is a shoe where the cons outweigh the pros. Having just been introduced to this brand in another model, the Oribi 3, I was excited to try out a shoe from the performance and competition series, especially one featuring an aggressive grip system to use for thorough hiking and one of my personal favorite blending of two sports: running and disc golf. As piqued as my interest was, it was tempered by some fit and comfort issues initially but ended with a bit of satisfaction after the lengthy break-in period. While I have experienced the fit of this brand previously, the Spirit 7 OLX is set on an aggressively narrow racing last, more than likely to make for a sleeker fit and reduce ground contact points for maneuverability over rocky terrain when moving at higher speeds. As this is listed as a competitive orienteering shoe, it appears to prioritize speed while giving maximum traction throughout the shoe. In this vein, the inner lining of the rearfoot has a very grippy overlay with an almost leather-like feel and a contoured collar that grips the heel very tightly, much the same as the slick and rubbery running board-like materials lining the midfoot and toe guard. Even the insole feels more grippy when compared to the average trail shoe. This gives the shoe a sure fit for the narrow-footed among us. But for the average to wide-footed runner, the shoe has an overall tight feel for the first several miles. If the shoes were a pair of jeans, I would compare the Oribi to a straight fit and the Spirit to more like a pair of skinny jeans. For the first week or so, I developed significant hotspots on the lateral heel and at the 4th and 5th digits of both feet due to the lack of flexibility in the upper and inner lining of the heel. In addition, for those looking to run without socks in their racing shoe, the upper is less than accommodating. While the mesh is soft and pliable, it has a rough texture and does not meld quite seamlessly with the overlays connected to the midsole of the shoe. This made for a very uncomfortable ride when running through grassy areas in the early morning, for a round of disc golf or on technical trails after a morning rain shower. On the positive side, because of the quality of materials used to form the upper of the shoe, it seems to be holding up quite well in most spots and like its cousin is very easy to clean. Time has loosened the materials to a certain extent and the overall softness of the inner lining has improved with added mileage (now up to 55 miles), but still feels lacking and does not instill confidence for runs longer than 3-5 miles and/or off-road distance races. While being a more minimally cushioned shoe, the feel underfoot is quite nice for a shoe designed for speed. The midfoot TPU, “shank” is more of a soft, light bolster to the arch and provides mild support while not limiting energy transfer through the midfoot and it is luxuriously flexible. At a listed 4mm heel to toe drop and with a low stack height, this shoe will delight those looking for a minimal ride while providing enough cushion for an off-road or adventure race. The foam is much more responsive and firm feeling than some of the more road-friendly hybrids like the Oribi and its cousin, the Acceleritas. It allows for the foot to have feedback from the ground while providing enough support to avoid the jarring or harsh feeling of some pure barefoot models such as the KSO from Vibram and the Merrell Vapor Glove. When in the great outdoors or over uneven and harsh surfaces this, “sweet spot” of cushioning can come in handy. The insole feels very basic and is appropriately thin for a minimalist shoe. As mentioned above, as well as in my review of the Oribi 3, the moisture management to the strobel and drainage system leaves a bit to be desired. This lack of moisture management tends to give this particular model a heavier feel, especially for a shoe that already comes in on the heavier side in-class (almost 8.7 ounces for a men's 9) with the premium and heavy-duty materials used. If there is a spot for improvement in this model, it definitely lies in the fit but also the feel on the upper materials, but the tuning of the midsole and insole cushioning makes up for it in spades. The outsole and carbide tip system in this model provided the most grip of any shoe I’ve ever owned. 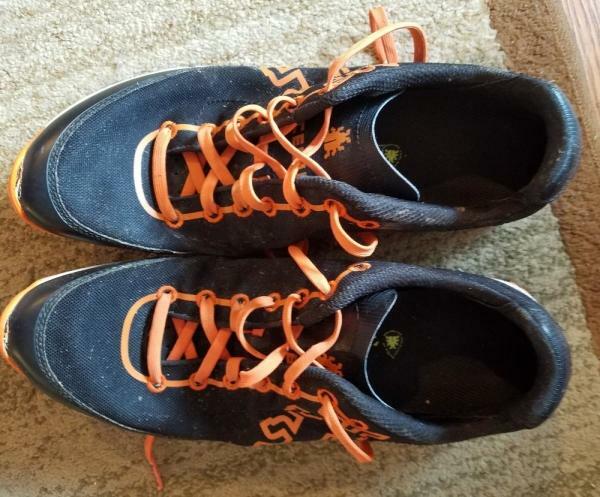 The sole really grip the dirt and even on loose surfaces like the edge of creek beds and going up steep hills with mud and loose rock, my ability to find purchase was never in question. The outsole material is very firm and steadfast. After 50+ miles of hard usage over technical trails, through several rounds of disc golf and on quick trail runs, the sole looks almost new. One very innovative yet simple feature that is noticeable is the sole pattern. With a deep recessed pattern such as the Spirit possesses, one can often experience a leaden feeling of the shoe in latter miles of a workout or race due to grass and mud getting stuck in the tread, but this track pattern seems to shed debris better than average. In terms of overall durability, there is only one flaw to this model. I noticed after about the first 20 miles into the shoe’s life, the top edge of the outsole connected to the toe cap began to detach. This seems purely cosmetic as it appears there is a heavy nylon stitching to prevent further shearing of the materials. In addition, the density and thickness of the outsole rubber in the forefoot gives the shoe a stiffer than usual feel for a performance or more minimal shoe limiting freedom of movement in the forefoot and toes. In combination with the narrow fit, these attributes can feel off-putting to fans of more minimal fare. Either a tweak to the softness of the compound or a reduction in thickness might remedy this deficit easily in future models. This model being one in a more established line for Icebug, it is clear that they have made efforts to refine the look of this shoe. While previous models had more girth and synthetic leather material overlays, the Spirit 7 has a dialed down look and puts more emphasis on the logo, which is printed into the shoe rather than adhered as in other models (a plus for those concerned about the logo peeling or wearing as referenced in my review of the Oribi 3). The main colorway fits well together and is pleasing to the eye like its cousin, but I am picking up a theme with very similar color schemes throughout the product line. The white midsole tends to fade and look cream to taupe colored when used for its primary function as a trail shoe (much the same as its cousin) and might be better served with a darker color to maintain the out of the box look for longer (although this certainly shouldn’t be a primary concern for most trail and outdoor enthusiasts, some day hikers, weekend warriors, and folks using this shoe as a winter road shoe or trail trainer). Even adding one additional colorway with a darker sole would be a huge plus. As the company expands its influence and grows in popularity, it would be great to see some additional options. Icebug has definitely crafted a niche shoe for a select, elite group of individuals looking for a tough, speed-oriented shoe for the slender foot. With a few tweaks, the Spirit 7 OLX has great potential to become beloved by a broad spectrum of outdoor enthusiasts looking for fun and safety in a stylish package. For the purpose of review, I’d like to thank Icebug for providing me with a pair of Spirit 7 OLX shoes. No additional compensation was provided and the review process objective over the course of a normal life cycle of my daily training shoes. The Icebug Spirit OLX is now in its 7th version. With several updates, Icebug aims to deliver comfortable and soft underfoot cushioning, especially for neutral pronators. The shoe is still as durable as its predecessor and offers reliable traction on the trail. The upper of the Icebug Spirit 7 OLX has been modified. It now has a thinner construction, and the shoe features the Bluesign® high abrasion PU material. These updates aim to provide a more comfortable running experience and at the same time reducing the shoe’s weight. To further enhance comfort and reduce weight, the latest version of the Spirit OLX comes with a low-cut collar and new midfoot design. The Icebug Spirit 7 OLX is available in standard running shoe length. The upper material wraps the foot comfortably without any constricting feel. The shoe is available in standard medium width for both men’s and women’s version. A rubber material comprises the outsole of the Spirit 7 OLX. It stretches in the entire outsole for durability. It also gives added cushioning without affecting flexibility. For maximum grip on varied trail surfaces, the outer sole has the 14 OLX carbide tip studs. There are eight studs in the forefoot, one in the arch area and the remaining five studs are placed in the heel. These carbide studs are more durable compared to steel, and they perform well on ice and muddy surfaces. The midsole of the Icebug Spirit 7 OLX makes use of a low-drop, compression-molded EVA. The EVA foam is lightweight and responsive in nature. It efficiently absorbs impact during landing and disperses it evenly for a smoother transition. Incorporated as well in the midsole is the ESS arch stabilizer which delivers reliable underfoot support. It gives runners a more consistent, stable ride on the trail. The removable sock liner is made from molded EVA. It gives added cushioning and further enhances comfort. The Bluesign® high abrasion PU material is placed in the upper of the Icebug Spirit 7 OLX. It protects the foot without compromising breathability and durability. It works well with the quick-drying Bluesign® mesh lining which keeps the foot cool and dry. The TPU mudguard provides foot protection during a muddy ride. It prevents mud and dirt from entering the shoe. To minimize pressure and pain at the Achilles tendon, the heel cup is made soft. It also has a depression in the center back for a pressure-less run. The shoe has a low-cut collar design. The tongue and collar are lightly padded to enhance comfort.